A recent report finds that Doug Ford’s election promise to end hallway medicine in Ontario is at odds with his government’s promised tax cuts, public service spending cuts and balanced budget. Following the election of Ford’s Progressive Conservative government, CUPE’s Ontario Council of Hospital Unions crunched the numbers on three Ford proposals and assessed the impact on hospitals. OCHU’s report, Hallway Medicine: It Can Be Fixed, looked at the implications of Ford’s promised $7 billion tax plan, balanced budget commitment and 4 per cent public service “efficiency” program, and found that far from ending hallway medicine, the bed crisis will actually deepen under Ford. In fact, Ontario’s hospitals, which are funded and staffed at levels well below other provinces, would see an overall loss of 2,467 to 3,712 more beds and between 8,560 to 16,418 jobs. OCHU followed up the provincial report with nearly two dozen media conferences to release the impacts of the Ford programs on bed and staffing cuts at local community hospitals. “It was important we raise the contradiction in the Progressive Conservatives’ promises with local communities. The government cannot achieve its promise to end hallway medicine and still cut public sector spending by four per cent,” says OCHU president Michael Hurley. Over the next two decades, there will be a huge demographic squeeze in Ontario, and the province will need to prepare for the realities of an aging population and people living longer. That means hallway medicine isn’t going away, unless the government makes it a priority. Hurley says the government has a moral obligation to end hallway medicine as promised, and that additional investments to alleviate overcrowding pressures in hospitals are needed for the life of the baby boom generation. 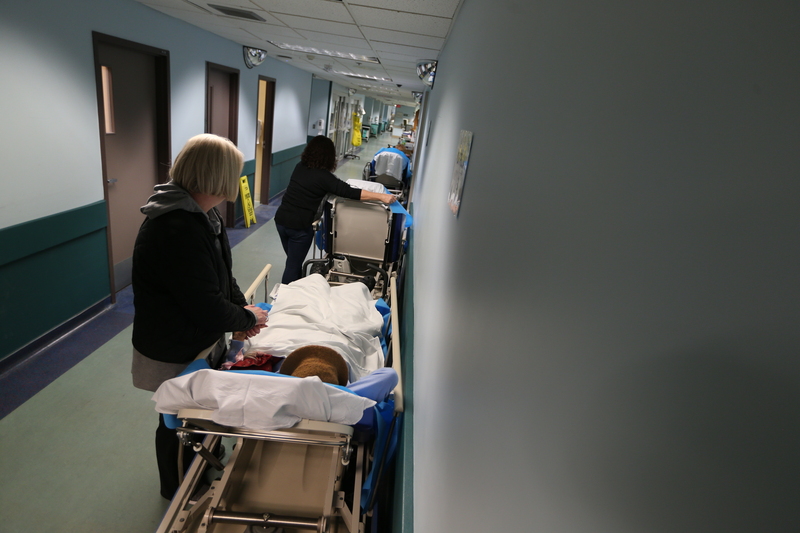 The OCHU/CUPE research makes several recommendations for ending hallway medicine including: funding hospitals at their actual costs; opening acute, complex continuing care and long-term care beds to deal with overcrowding; investing in mental health and addictions; and stepping away from restructuring and privatization.